Gift Tray & Label – B – Essex County Naturals. 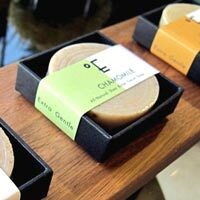 Note – ongoing exposure to light speeds up oxidation of the soap which shortens shelf life and can cause the outer appearance of the soap to dull so please bear this in mind when selecting ‘narrow’ width labels. Store in a dark, cool and dry place to maintain product freshness and quality. Single gift trays available in the following colours: midnite black, ivory white, sandy brown, mahogany, sea green, apricot, gold. 2,3 and 4 piece gift trays available in mahogany only. For custom colours and sizes please inquire directly.